U.S. telecom Sprint Corp Chief Executive Marcelo Claure talks to the media in Havana, Cuba, Nov. 2, 2015. 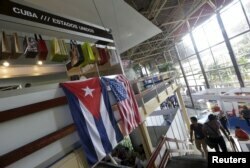 Cuba signed a roaming agreement with U.S. telecom Sprint Corp. during its first annual trade fair since rapprochement with the United States and told 600 companies from 70 countries at that it was eager for more business. The Havana International Fair (FIHAV) promotes Cuba's changing business climate and seeks badly needed foreign investment. Last year's event championed a new tax-cutting foreign investment law, while this year's boasted of improved ties with the United States. In a historic breakthrough on Dec. 17, the former Cold War foes vowed to normalize relations, although the U.S. trade embargo on Cuba remains in place. Cuba's critics denounce the fair as hype, noting that all business deals must go through the communist government or one of its tightly-controlled state companies. Cuba acknowledged the central role of the state but also plugged its growing private sector, mostly farm cooperatives and small businesses so far. "We are continuing to create the conditions for separating state and business functions and to improve the role that should be played by socialist state enterprises..., guaranteeing more flexible functioning," Foreign Trade Minister Rodrigo Malmierca told the opening ceremony. U.S. and Cuban flags hang on a wall at the U.S pavilion during the Havana International Fair (FIHAV), Havana, Cuba, Nov. 2, 2015. Sprint, one of about 30 U.S. companies attending, has taken advantage of the limited commercial opening afforded by U.S. President Barack Obama, who has chipped away at the embargo and created a telecommunications exemption. Among the companies hopeful of doing business here some day was PepsiCo, which had a stand in one of the exhibition halls. Sprint signed an interconnection agreement with Cuba's state telecoms monopoly Etecsa on Sept. 25 and added the roaming agreement on Monday. Sprint competitor Verizon has been offering voice and data roaming in Cuba since September through a third party. "We signed this agreement in record time," Sprint Chief Executive Marcelo Claure told reporters, saying he was "blown away" with how fast the Cuban government negotiated the deal. "They were a pleasure to work with. Like with anybody else, there were tense moments. We would like to pay a lower rate. But it's a start," Claure said. American companies will lag behind those from Cuba's strategic partners Venezuela, China and Russia. Spain also has enjoyed a long business relationship with Cuba and has the largest presence at the fair with 150 companies. "We're not afraid of competition," said Jose Manuel Soria, Spain's minister of industry, energy, and tourism. "We think that the more countries that come, the better."